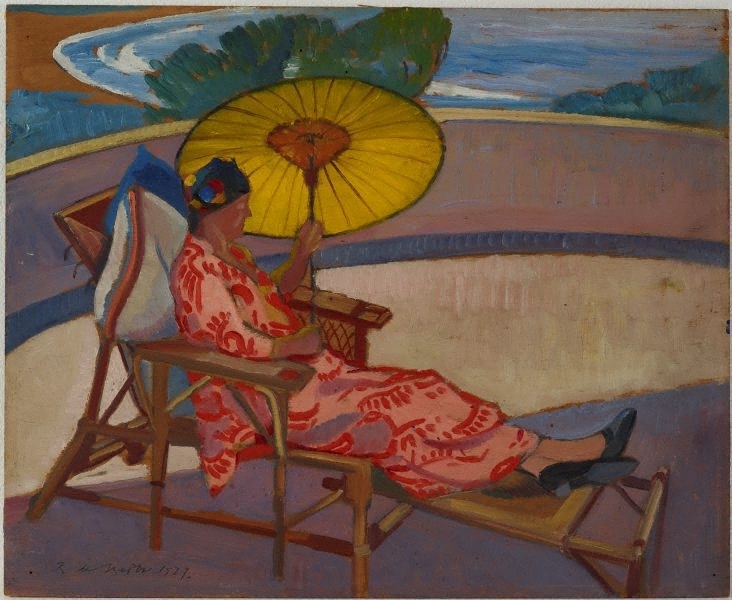 Like Wakelin, de Maistre recanted the incipient abstraction of his colour harmonies in favour of a blander, more saleable, variation of modernism. Habitually broke, neither of them could afford the luxury of avant-gardism for long. This image is a slice of middle-class life destined for return to it. De Maistre understood this, but it did not blight his authorship of some of the lushest landscape and genre paintings of the 1920s. Never uninteresting, he is no less than compelling in this solar homage to Sydney's Palm Beach. Having expatriated himself to England in 1930, de Maistre honed an adapt-ably academic cubism that influenced his admirer, the young Francis Bacon. Signed and dated l.l. corner, pencil "R de M (illeg.) 1927". Signed upper c. verso, pencil "... R de M.".